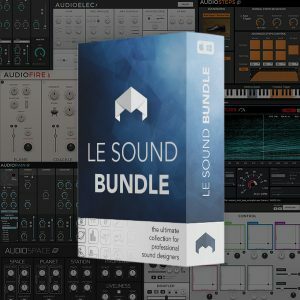 Le Sound Bundle is an original & innovative offer: you will have access to all the plug-ins (including the regular new release) without extra charge as long as you stay subscribed. Le Sound Bundle contains: AudioWind, AudioRain, AudioMotors, AudioSteps, AudioElec, AudioSpace, AudioFire and Reshape. Join award-winning studios/sound designers like Lucasfilm, Ubisoft, Harry Cohen and Richard Devine to create vivid soundscapes with Le Sound Bundle.